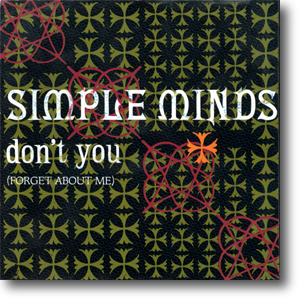 don't you (forget about me) us promo 7"
7" with red promotional paper labels with large centre hole in full colour sleeve. This double-A sided promo of the single was housed in the original US picture sleeve. A large number of copies were produced, making it still relatively common today. 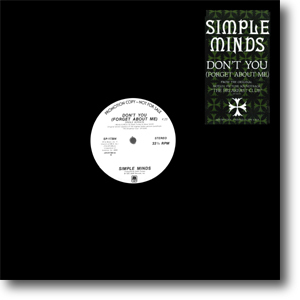 don't you (forget about me) us promo 12"
12" with black and white promo labels in black die-cut sleeve with sticker. A&M felt sure of the single's success, for they went to the trouble of printing special stickers for the normally plain black die-cut sleeves. 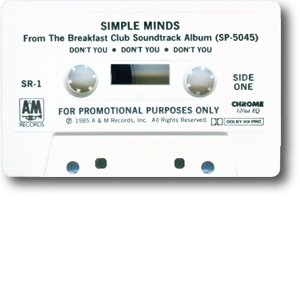 Extremely rare this promo cassette simply features the title track multiple times on each side.